U.S. Population Is Becoming Older, And Less White, Than Ever Before White people remain the majority in the U.S. — but the Census Bureau says non-Hispanic whites were the only racial group that didn't grow from 2016 to 2017. Shuttered businesses and abandoned buildings are a common sight in the southwestern Pennsylvania town of Brownsville. 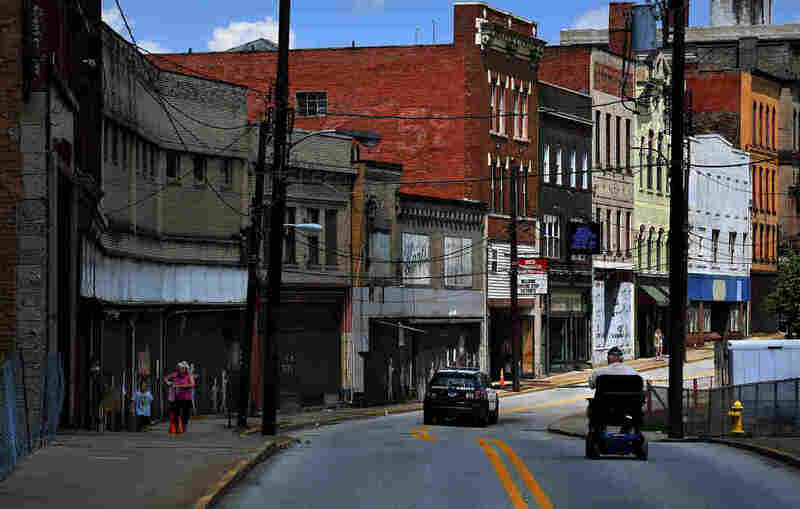 Pennsylvania is one of 26 states with an increasing mortality rate among whites. Among other racial groups, Asians were found to be growing at the fastest pace, 3.1 percent — and numbered 22.2 million in 2017. The second-fastest-growing group: people who identify as two or more races. That group rose by 2.9 percent in 2017. The U.S. population is also getting older. "The Census Bureau's new estimates also show that since 2010, the median age in the U.S. jumped from just over 37 years to 38," NPR's Hansi Lo Wang reports for our Newscast unit. "That's because baby boomers and millennials are aging, as the country's birthrate keeps declining." In 2017, Florida had the highest percentage of seniors (age 65 and older), with 20.1 percent, the Census Bureau says. Maine and West Virginia followed, each with more than 19 percent seniors. The smallest number of seniors were in Utah (10.8 percent) — which also had the lowest median age (30.9 years). The next-smallest percentages of seniors were in Alaska (11.2 percent) and the District of Columbia (12.1 percent). The census data came out the same week as a study by the Applied Population Lab, which found that deaths among white people "exceeded white births in the nation as a whole for the first time in U.S. history in 2016." That study cites data from the National Center for Health Statistics; the Applied Population Lab is part of the University of Wisconsin and often works with the Census Bureau through the State Data Center Program. "The white natural loss of 39,000 in 2016 compares to a natural gain of 393,000 in 1999," the APL says of the broader trend. As for what's behind the drop in the white population size, the APL identified two trends that it says are "accelerating the incidence of white natural decrease." The first is a big drop in U.S. fertility that hit the country as it went through the Great Recession — some 500,000 fewer babies are now being born annually than would have been expected, and almost 2.1 million women of childbearing age have remained childless. The second trend is an increasing mortality rate among whites from 30 to 59 years old, in what are often deemed "deaths of despair" — deaths that are found to be from causes such as suicide, accidental drug overdose and alcohol. "In fact, such deaths of despair were the difference between natural increase and natural decrease in eight of the twenty-six states with white natural decrease in 2016," the APL says. As for where those changes are happening, the group says, "state-level white natural decrease is occurring in populous states with diverse economies and numerous metropolitan areas such as California, Florida, Pennsylvania, New Jersey, Arizona, Massachusetts and more recently in Ohio and Michigan." It adds that the white decrease has been an ongoing process for at least the past decade in some states, citing Rhode Island, West Virginia, New Mexico and Connecticut.